Two former VFL footballers passed away on the same day last month, coincidentally both Richmond players. The great Billy Barrot sadly left this mortal coil at the age of 72, while Kevin Coppock, who played two games for the Tigers in 1953, passed on at age 84. To have two former V/AFL players, occasionally even three, die on the same day is not common but neither is it particularly unusual. Six players on the same day, however, is something different altogether. And when those six are all still at a football-playing age, it is something catastrophic. Such an unfortunate confluence of events occurred on. Six former VFL players – Collingwood’s Alan Cordner, Melbourne’s Fen McDonald, Claude Crowl (St Kilda), Rupert Balfe (University) and Melbourne’s Joe Pearce – all lost their lives on April 25th at Gallipoli. The Game of Their Lives. It’s upon reading such stories that one is hit by the reality of events a century ago. For many of us, the true impact of war is well removed from our daily lives. But 100 years ago, the Great War affected the lives and families of many Australians, though it was fought thousands of miles of way. It also affected sports and sporting clubs and leagues in ways that would be hard for most us to fathom in 2016. The Game of Their Lives focusses specifically on the sport of football, and more specifically the Australian code of the game. In the book’s first chapter, Richardson introduces us to footballers travelling to Sydney or beyond, to play in one of two simultaneous Australian football carnivals that were being held in 1914. On the eve of the carnivals, the spectre of war is hanging over Europe, and with Australia’s ties with the mother country still very strong, a pall was cast over normally far more festive events. The players introduced include South Melbourne’s Bruce Sloss, Dan Scullin from Western Australia’s Goldfields League, Richmond’s Hughie James and Jimmy Foy from Perth. Throughout Richardson’s book, these men—and others—feature intermittently. They flash in and out of the play or, to take the football analogy further, are benched, returning to the ‘field’ in a later chapter. All come together in chapter 6—The Game—which vividly brings to life—a century after it was played—the famous match played at Queen’s Club, West Kensington in London in October 1916, between the Australian 3rd Division and a team made up of the training units of the Australian 1st and 2nd Divisions. While that match on its own is a key moment in Richardson’s fine work, it is of course set against the backdrop of the “greater game”—the Great War itself—and its impact on the lives of all those involved: footballers and non-footballers, their brothers and sisters, their mothers and fathers, their wives and girlfriends back at home. Richardson brings into sharp focus the deep divisions that developed in society and in parliament back in Australia, when it came to the question of how much of a commitment should be made to a faraway war being fought by the mother country. In particular, debate raged on the subject of football and footballers. Should not our best athletes be offering up their physical skills and prowess to a greater goal than a football premiership? Should organised football be played at all while Australia was at war? These were vexed questions 100 years ago, asked in cities, suburbs and towns all over Australia. There were no easy answers then and, even with the benefit of a century of hindsight, no less difficult to answer now. Richardson adroitly navigates us through the pros and cons as presented and argued by the protagonists, including Australia’s Prime Minister Billy Hughes, who took the question of conscription to a national referendum. Australian Rules football was the great love of the subjects of The Game of Their Lives but it was in the “greater game” that their ultimate fate would be decided. Some of the players that Richardson brings “to the bench” were never return to the field of play, their lives ended by the randomness of location and circumstance, while some of their war ‘teammates’ would return to play top level football in Melbourne, Adelaide and Perth. Richardson takes us on the journeys of several of these players, and into the psyche of Australian society at a time of war and hardship. He demonstrates how vital the Australian game was to the soldiers abroad, not just in exhibition matches such as that played at Queen’s Club but also in the many scratch matches and other organised games that took place in the most unlikely of places on the most unlikely of fields throughout the conflict. As he weaves readers in and out of the players’ lives, Richardson invites us to reflect on war—its seeming necessity at times, but also its obvious futility at others—and how it impacted on the lives and loved ones of champion footballers of long ago. By enabling us to get the know those players, on almost a personal level in some cases, he sheets home with great poignancy how a similar conflict today might affect the lives of the stars we adulate in 2016, and the reader cannot help but reflect upon how such events would affect the fans, too. We take football for granted as we devour it daily via media not thought of 100 years ago. Richardson pricks our conscience and forces us to consider how war could change all that, and do so quickly. The Game of Their Lives is an excellent read for anyone with an interest in football, or in war history. For those with an interest in both, it is a must. 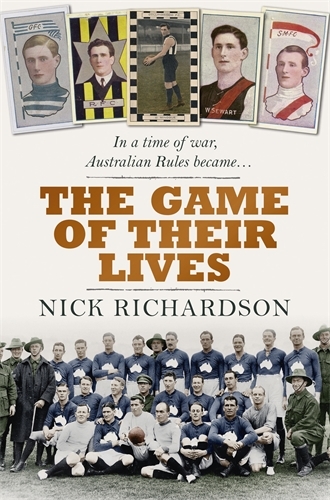 The Game of Their Lives, by Nick Richardson, published by Pan Macmillan Australia is available via Readings and Booktopia and other bookstores.